Intelsat, Ltd. announced in December 2008 a joint venture with a South African investor group led by Convergence Partners that will utilize project financing to build and launch a new satellite into the 33º East orbital location, ideally positioned to serve the African continent. The satellite, to be called Intelsat New Dawn will feature a 28 C- and 24 Ku-band 36 MHz transponder units payload optimized to deliver wireless backhaul, broadband and television programming to the continent and is expected to enter service in early 2011. The satellite will be operated and marketed as part of the global Intelsat fleet. New Dawn will take over from Galaxy 11, which was relocated to 33° East in November 2008, where it is used to complement and back up the ailing IS-802 until the planned arrival of New Dawn in 2011. New Dawn was successfully launched on 22. April 2011, but after reaching geostationary orbit, but has been unable to deploy its C-band reflector antenna, depriving the satellite of half its intended functionality, because the antenna’s spring-loaded deployment mechanism got caught in the billows of its sun shield. The same happened to the Ku-band reflector, but due to the motor-driven deployment mechanism, the reflector could be freed and deployed. The defect also is expected to cost Intelsat about two years of service life for New Dawn. The company’s attempts to shake loose the C-band antenna in April and May used about a year’s worth of fuel. 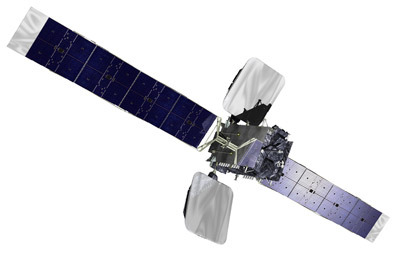 New Dawn’s commercial life likely will be cut by another year given the fact that it must be flown in a way that was not planned, with the C-band antenna still tucked against its frame. So the expected life time was reduced to 12 years.